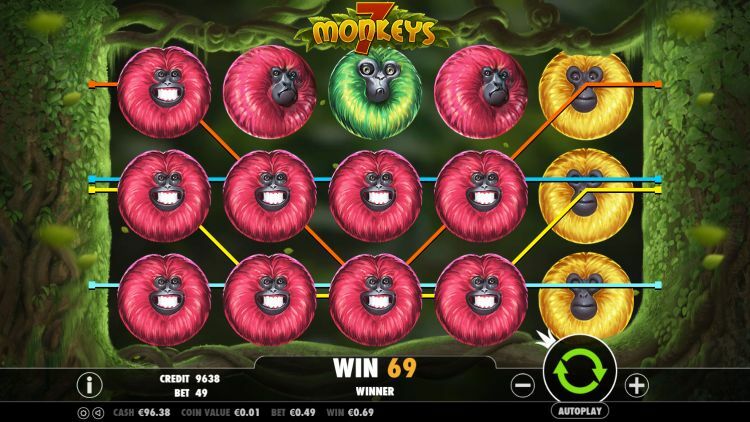 7 Monkeys is a very popular online pokie that is brought to us by the talented folks of Pragmatic Play. Stars of the show are 7 different monkeys, and they love to bring playful mayhem to your pc-screen or mobile device. The simple gameplay, frequent bonus rounds and stacked wilds have proven to be a winning formula for Pragmatic Play, a software company that has taken the online gaming industry by storm. Besides 7 different monkeys, this pokie also has 7 pay lines. The minimum bet? You guessed it: $0.07 per spin. This is a low variance pokie, which makes it a great pokie to play for anyone that is looking to try out a new slot without risking breaking the bank within a few minutes. 7 Monkeys will give you lots of playing time for your money, just don’t expect huge wins. The return to player is a poor 92,71%, which is nowhere near what we find acceptable. We always recommend playing pokies with a higher return to player of at least 96% and preferably even more. 7 Monkeys is a simple pokie, with a 5 x 3 setup. There are just fixed 7 pay lines and 7 different symbols. Visually, it is quite pleasing, with colourful monkeys against a jungle background. The reels spin smoothly, and the win animations with the coins flying are always a welcome sight. All payouts are from right to left, and the betting range is between $0.07 and $35 per spin. The brightly coloured baboon is the leader of the pack and acts as a wild symbol, substituting for all symbols except the banana, which is the scatter symbol. 5 wilds on an active pay line are worth 1.500 coins. The yellow monkey is second in the hierarchy and pays out 150 coins when you line up 5 of them on an active pay line. All other monkeys are worth a lot less: between 15 and 50 coins when you get a 5 of a kind on an active pay line. All symbols are stacked, and full screens of the same symbol are a common occurrence. Besides frolicking in the trees and showing their butts to onlookers, monkeys genuinely love their fruits. And by fruits we mean bananas. In true style, the free spins bonus is activated when 3 or more scattered bananas appear on the reels. In most cases, you will win the 50 free spins, but we have seen quite a bit of 100 free spins as well. The 150 free spins with the 3 x multiplier are very rare. Whenever 3 or more bananas appear during the free spins, another 15 free spins are awarded. There is no limit to the number of free spins you can win. The maximum payout in the bonus round is $75k, but you need to be playing max bet and get a full screen of wilds to achieve that feat. 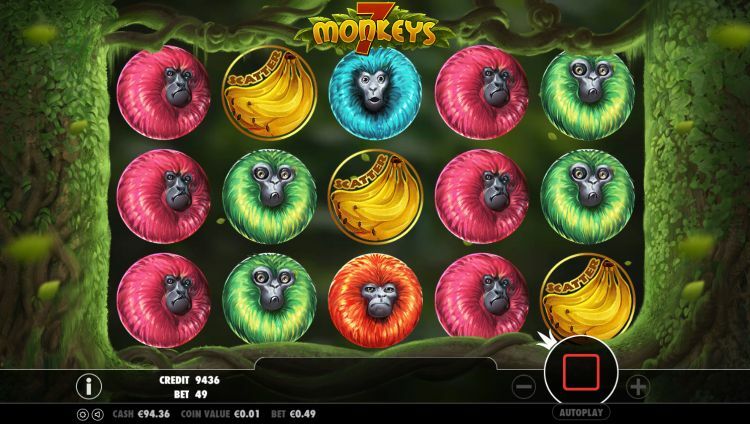 7 Monkeys is not our favourite Pragmatic Play pokie. Not by a long shot. We feel the variance is too low for our taste and the gameplay is just a little bit too monotonous. On top that the RTP of just over 92% is dreadful and unacceptable for an online pokie. Thankfully, most other Pragmatic Play pokies pay out between 96% and 97%, so all is not lost. This pokie is very popular, however, and we feel the fun theme, and simple gameplay has a lot to do with that. So, by all means, try out 7 Monkeys. Just know that there are better pokies by Pragmatic Play to be found, such as the fantastic Wolf Gold and the brilliant Vegas Nights. 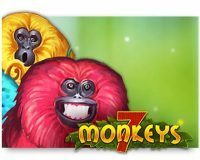 You can play 7 Monkeys and all other Pragmatic Play pokies at Mucho Vegas, which happens to be one of our favourite online casinos. This cheerful and fun casino offers new players an exceptional welcome package which is worth up to $1,500 and 150 free spins. Play 7 Monkeys at Mucho Vegas with a 100% bonus up to $100.